There is much to look forward to in a school filled with music, sports, and acting. After school starts, the fall play in November is always a big hit among staff, students, and community members. In April, the spring musical is just as popular. This year, musical auditions had a big turnout as students from all grades came to show off their talent. 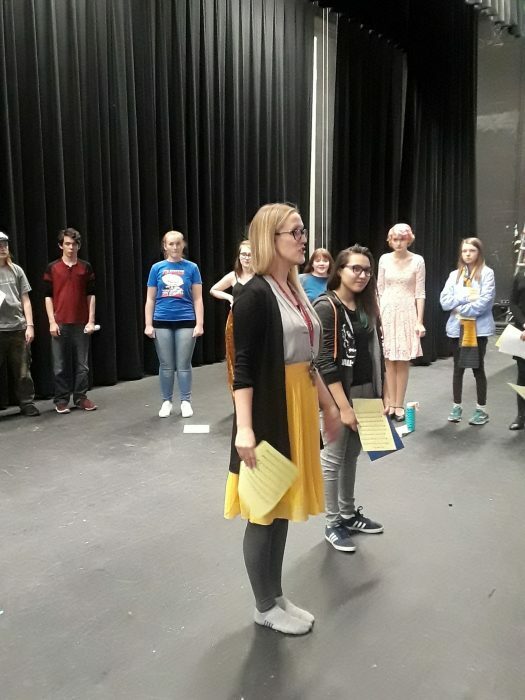 The musical is “Cinderella” and all who auditioned had to pick a part they wanted to play and prepare a song and monologue that fit their character’s personality. Then it was showtime. Auditions lasted from Monday to Tuesday, with Monday being singing and monologues and Tuesday dancing. Many were hesitant or anxious, with auditions being their first time on stage. “I kind of struggle from a little bit of stage fright, so I can’t go out for a lead because being out there, it just makes me nervous,” junior Emily Denton said. It wasn’t just stage fright that students faced. According to sophomore Duyanne Trujillo, she struggled with confidence and her stage presence. Yet she found a way to be confident during her singing audition. “I’m pretty sure my voice went a lot more powerful than I expected it to be, so I think that kind of boosted my confidence a little bit for the stage,” Trujillo said. However, auditions weren’t all bad. Many of the students enjoyed being on stage and having the opportunity to go all out for “Cinderella”. Even while auditioning, a few students felt like the atmosphere on stage was one that was relaxed, comfortable and supportive, while still maintaining the professionalism that is expected from performers. “I definitely felt like I was being expected to set some sort of standard and raise myself up to the standar,” senior Wesley Moore said. In a land of fairy godmothers and Prince Charming, these actors and actresses showed the judges what they were capable of and the musical in April will show just how hard these students worked. “It’s a really good musical and I think we have the cast for it this year,” said Moore.